I’d been trying to avoid spoilers about the new Star Wars film, but I couldn’t help seeing some murmurings about it online and I went in there expecting disappointment. Overall, it was entertaining enough but suffered a major problem with plot. In story telling, a plot is more than just a sequence of actions happening one after the other. It is a sequence of actions that has direction and payoff, that has impact on the story as a whole, that has purpose. Let’s look at Finn’s plotline for the bulk of this movie. He attempts to run away (completely undermining his character development from The Force Awakens, but that’s a separate rant), meets Rose, they come up with a plan, they go to the casino, get arrested, make a deal with a codebreaker, break onto the ship, get captured, and then manage to escape when the ship is destroyed. Lots of events happen, but to what end? They achieve nothing and end up with the resistance, exactly where they would be if they’d done nothing. There are only two events in their whole plotline that could loosely be considered significant: spreading the story of the resistance, and killing Phasma. I quite liked the ending with the kids telling the story of the resistance – it was a nice little closing piece about hope being still alive and the resistance message going on – but it’s hardly a major event in the plot of the film overall. Maybe something significant will come of it in the next instalment and make it feel like there was purpose to this little dangling plot thread, but if you look at this film on its own, it was too minor to feel like a proper payoff for their plot. The killing of Phasma likewise didn’t feel significant enough. She was a non-entity in this film, who only showed up to be killed. I was seeing this film with my parents, both of whom had only seen The Force Awakens once, when it first came out. Neither of them remembered Phasma. If seen in the context of the previous film, this moment might have been worth something, but again, treating this movie as an entity in its own right, she wasn’t a significant enough player for this to be important. If she had been seen earlier on, ordering Stormtroopers to board resistance ships, commanding parts of the battle, playing a role in the conflict with Hux and Kylo Ren, her death might have had more meaning. As it was, you could have cut that entire plotline and it wouldn’t have changed the outcome of the story as a whole. The same applies to Poe’s failed mutiny. What does that achieve? He gets worried that their leader is just running with no real plan, stages a mutiny, gets shot, and then learns that she’d had a plan all along. All it would have taken was her saying, “I do have a plan,” for none of that to have happened. She wouldn’t have even had to reveal what her plan was (although there was absolutely no reason to conceal it), just reassure the resistance fighters that there was a plan at all. Poe only acted because he thought she was just running until they ran out of fuel. This whole conflict was pointless, and it ended exactly the same way it would have done if he’d done absolutely nothing. These were cul-de-sac plots – they feel like they’re heading somewhere but to end up going nowhere. It felt like Finn and Poe were being given busy work to keep them occupied while the main plot happened with Rey and Kylo Ren. There needed to be payoff to the plotlines for the story to work as a whole. This payoff needn’t have been the characters’ intended goals but it should have impacted on the rest of the story as a whole. If we take the original Star Wars film as an example, Luke and co’s goal was to deliver R2 to Alderaan. Instead, they found Alderaan destroyed and were utterly unable to complete the mission they were intent on. But that inability to complete the mission led to the rescue of Leia. The Last Jedi needed the Finn and Poe plotlines to result in something. Rey and Kylo Ren were on one ship on the fleet while Rose and Finn were breaking in to try and shut down the tracker. I was never clear whether they were on the same ship or not, but if they were, the plotlines could have intersected. Kylo Ren was knocked unconscious after the fight with Rey, so why not have the same happen to Rey? Finn and Rose could have escaped from the Stormtroopers, found Rey, and the three of them escape together. Or they could have sabotaged the weapons allowing more transports to escape. They could have achieved something on that ship to give a purpose to everything that came before. The same goes for Poe after the first five minutes of the movie are over. His conflict with the admiral was entirely pointless, both because it could have been avoided with a single line of dialogue and because it achieved nothing. He needed a purpose to his plotline. Maybe the admiral was being secretive because she was afraid a First Order spy was sending their ship location and that was how they were being tracked. Poe could have been uncovering a spy and saving the ship that way while everything else was going on. The film was enjoyable enough to watch while it was going on, but incredibly frustrating to think about afterwards. It still outshone the prequels in a big way, but I think it missed being what it could have been because of failures in plotting. Over the past few weeks, I’ve done a handful of Christmas fairs. 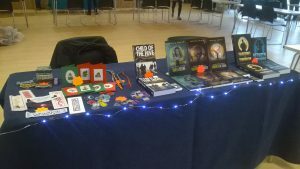 The main purpose was to sell and promote my books, but I also had a sideline of various cross stitch bits and pieces to help cover the cost of the table. The first fair was very slow. I don’t know whether it was the weather (miserable and rainy), the fact that I was upstairs, poor marketing, or something else entirely. Everyone else seemed to be finding business quite slow too, so I didn’t take it personally, and I did sell some books. The highlight of that first fair was when a boy was being led off down on aisle by his parents only to spot my stall. He yelled out, “books!” and instantly rushed over to me. In the end, his parents decided (probably correctly) that he was a little too young for my books so they didn’t buy them, but I heartedly approve of that attitude on seeing a table covered in books. The second fair was much busier and I sold each of my books at least once, some more than once. What surprised me though were how well the cross stitch badges went. I nearly ran out of stock! I had to get busily sewing before the next craft fair. There were a few highlights from that second fair, including the woman who literally recoiled in horror when I said the books were science fiction – I’ve never seen such a strong reaction and it made me laugh. There was also the guy who bought eight of my badges, including a Babylon 5 Earth Alliance logo, despite not knowing Babylon 5 – I guess he really liked badges. But the best moment of the fair had to be the expression on a teenaged girl’s face when she saw I had the pan pride flag as one of my badges. She just lit up with excitement on seeing it in my little badge collection. I’d been a little hesitant about doing the pride badges (especially since one of the fairs was at a church hall and I wasn’t sure what the reaction was going to be) but that expression made it all worth it. I’m definitely sewing a replacement of that for the next set of fairs. This weekend was the final fair. I covered my table costs and sold a couple of books, but only because I sold some things to other stallholders. In terms of general public, the fair was dead. More than half the time there was no one looking around at all, so it was just all the stallholders chatting to each other. On the plus side, I sold a bookmark before I even finished it. I’d taken along a half-finished bookmark in case things got slow (I should have taken several because slow didn’t cover it) and one of the stallholders saw me working on it and asked, “Is that spoken for?” She bought the bookmark when it was still incomplete and I spent the next couple of hours finishing it before I joined the ranks of the bored stallholders.